Pamper yourself with a visit to the spa, which offers massages, body treatments, and facials. You can take advantage of recreational amenities such as an outdoor pool, an indoor pool, and a spa tub. Additional amenities at this hotel include concierge services, babysitting/childcare (surcharge), and a banquet hall. 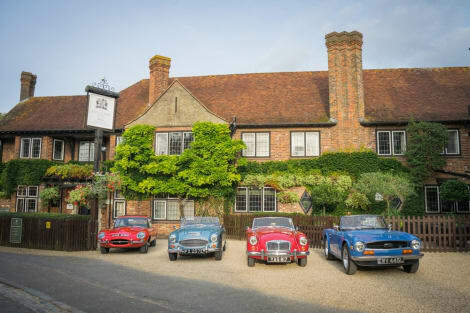 With a stay at Balmer Lawn Hotel in Brockenhurst, you'll be in the historical district, within a 15-minute drive of Beaulieu National Motor Museum and Brockenhurst College. This 4-star hotel is 10.2 mi (16.4 km) from Peppa Pig World and 13.1 mi (21 km) from Southampton Cruise Terminal. Make yourself at home in one of the 50 individually furnished guestrooms, featuring refrigerators and DVD players. Flat-screen televisions with satellite programming provide entertainment, while complimentary wireless Internet access keeps you connected. Private bathrooms with shower/tub combinations feature designer toiletries and hair dryers. Conveniences include phones, as well as safes and desks. Make yourself at home in one of the 77 guestrooms. Complimentary wireless Internet access keeps you connected, and digital programming is available for your entertainment. Private bathrooms with shower/tub combinations feature complimentary toiletries and hair dryers. Conveniences include phones, as well as safes and desks. Take in the views from a terrace and a garden and make use of amenities such as complimentary wireless Internet access. This hotel also features concierge services, babysitting/childcare (surcharge), and wedding services. lastminute.com has a fantastic range of hotels in Brockenhurst, with everything from cheap hotels to luxurious five star accommodation available. We like to live up to our last minute name so remember you can book any one of our excellent Brockenhurst hotels up until midnight and stay the same night.